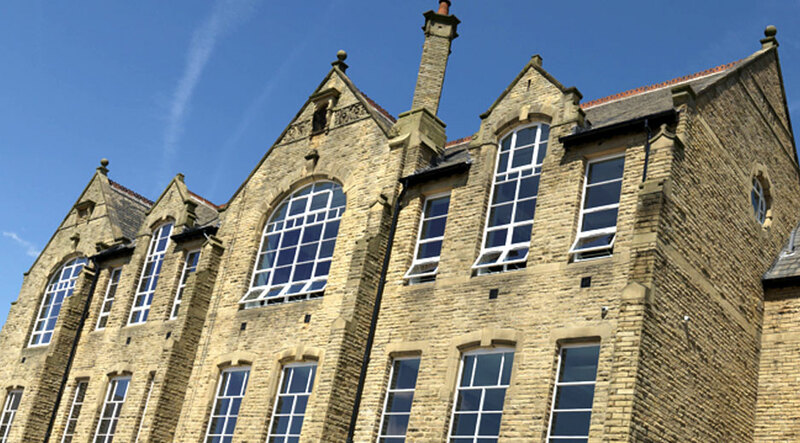 The former Anns Grove School in Heeley is opening its doors again in June 2013 after seven years of closure. Now known as Sum Studios, the development has been a labour of love by Heeley Development Trust, redeveloped to offer artists, creative, digital and technology companies a new place to call home, in what is fast becoming Sheffield’s creative neighbourhood. The Grade II listed building was left to fall into a state of disrepair when the school moved out in 2006. The (painful!) renovation process, which involved the treatment of dry rot, revealed some amazing features designed by renowned Sheffield architect C J Innocent and luckily we’ve been able to save lots of them, including pitch pine beams, the cupolas that form the school’s natural ventilation system, the bespoke roof tiling and some Yorkstone flagging. The business studios will open first, followed by workshops and exhibition space for artists, and then a building dedicated to community use. In time, an on-site café will open and the UK Online Centre will re-locate there. The next few years will see a varied community of businesses, individuals, artists and local residents make Sum Studios their own. A central shared courtyard means everyone can meet and mix, plus an extensive calendar of community events will give the place a unique energy and sense of community. Support for the project has come from both Sheffield icons and successful, creative businesses. The anchor tenants for the project include Peter & Paul, The Brand New Idea, Matt Lollar, Cut Out and Keep and Curv Creative – who were actually pupils at the original school. Brilliant to see the doors of the old Anns Grove school open again!